Kayla Itsines is an Australian personal trainer, an author as well as an entrepreneur whose name is known by many people. She is also one of the 30 influential people on social media according to Time on March 2016. She has also launched ebooks titled Bikini Body Guides and workout app, Sweat with Kayla. Furthermore, Kayla and her partner Tobi Pearce were included in the Young Rich list of the wealthiest Australians under the age of 40 who had not inherited their money. Now, let’s get to know more about this sensational fitness guru’s personal as well as professional life! Kayla Itsines was born in the city of Adelaide, South Australia on 21st May 1991. She is native Australian and belongs to Greek ethnicity. Her zodiac sign is Gemini. She was born in the Itsines family to Anna and Jim Itsines. She was raised along with sibling sister, Leah Itsines. Furthermore, at the age of 18, she earned her graduation form Australian Institute of Fitness. Engaged with Long-time Boyfriend; Married? Kayla began her career by working at a women’s gym in Adelaide where she started aerobic exercises classes after she saw machine-based courses which had no impact on the client’s fitness. Her aerobic sessions made a vast difference in her client fitness. In 2013, along with the help of her partner Tobi, they founded the Bikini Body Training company. They also published two Bikini Body Guides with her workout in one volume and nutrition/diet information from dietitians Julie Dundon and Anne Schneider. Their ebook was downloaded more than one million times by October 2013. Kayla has also garnered more than 9.9 million followers on Instagram from her training, workout videos and pictures. However, how much has this fitness guru accumulated? Well, Australian fitness entrepreneur Kayla net worth is estimated at $63 million as of 2018. Her partner Tobi’s net worth is estimated at $46 million. Australian fitness entrepreneur, Kayla is romantically living with her longtime boyfriend and now business partner Tobi Pearce. His real name is Tobias “Tobi” Pearce. She even got engaged with Tobi on April 2018. Kayla began dating her fiancée for a long time but hasn’t officially announced when the couple first met and where did they date. It is said that Kayla and her partner Tobi first met at the gym and fell in love. At that time her soulmate was studying to garner double-degree in personal trainer course as well as Law and Commerce. Recently, in April 2018, Kayla is engaged to her long-time boyfriend turned fiancée Tobi Pearce. The duo has been living together for almost five years now. The duo might be planning to share their vows by having an intimate wedding ceremony, but with their busy career and schedule, the soulmate might not be tagged as happily married anytime soon. 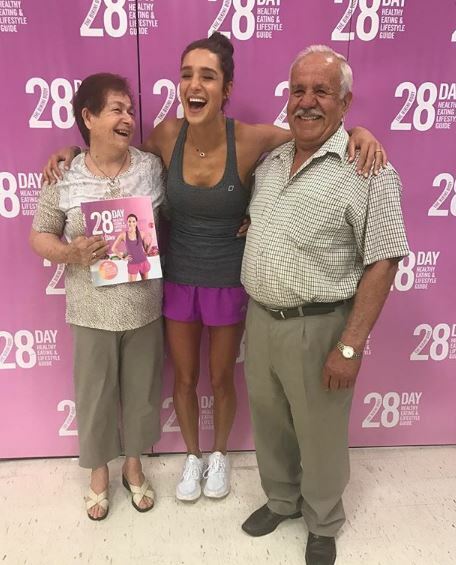 Kayla is born in the Itsines family to mother Anna and father Jim Itsines. Her family heritage is of Greek descent. Moreover, she was raised by her parent along with sibling sister, Leah Itsines. Her sister is a food stylist and a personal trainer. As a fitness guru, Kayla height is measured at 5 feet 5 inches and weighs 52 kilos. She has a fit body measuring at 34-24-35. She has olive skin, Brown hair and Brown eye.